Imagine crystal white sands bordering an emerald blue sea, the salty breeze drifting gently above the waters, and an atmosphere meant for a royal experience. Welcome to the island vacation of your dreams! If you have a love for luxury and relaxation, the Island Princess resort on Okaloosa Island is the ultimate destination. One of the premier destinations on the Florida Emerald Coast, this resort is one of the most luxurious Okaloosa Island condo rentals available. The resort is a seven-story building made up of condominiums surrounded by the strikingly beautiful waters of the Gulf of Mexico. It is on the island of Okaloosa, which is part of Florida’s Emerald Coast. The island itself is famous for its powdered sugar beaches and luxurious coastline amenities. From any of its seven stories, the resort boasts dramatic and breathtaking views in each one of its one, two, or three bedroom condominiums. The opportunities for pampering are endless. Take a dip in the seasonally heated pool, relax on the gulf-side, enjoy the benefits of the fitness room, or explore the multi-dimensional Okaloosa Island and all that it has to offer. There are many fantastic restaurants nearby that cater to and welcome all visitors. The Gulfarium Marine Adventure Park is an extremely popular attraction—and with good reason. There is so much to discover! Stingrays, gators, reptiles, turtles, and so much more await you at the Gulfarium. For a relaxing yet competitive activity, enjoy spending some time at the Island Center golf center, where you can play surrounded by beautiful and peaceful scenery. It is no secret that the Gulf of Mexico offers some of the most beautiful views in the world. From the top of your balcony you can see over 300 feet of white sands and can enjoy the contrast of snowy sand against the emerald waters. Enjoy sipping on your mug of coffee while keeping an eye out for a playful dolphin appearance. The resort is a favorite on the island, no doubt because of its many flawless amenities. At the resort you can enjoy a dip in the sparkling gulf front pool, relax in the hot tub, or reenergize in the fitness center. In addition the coastal views, Island Princess is complimented by lush shrubbery, beautiful flowers, and swaying palm trees. 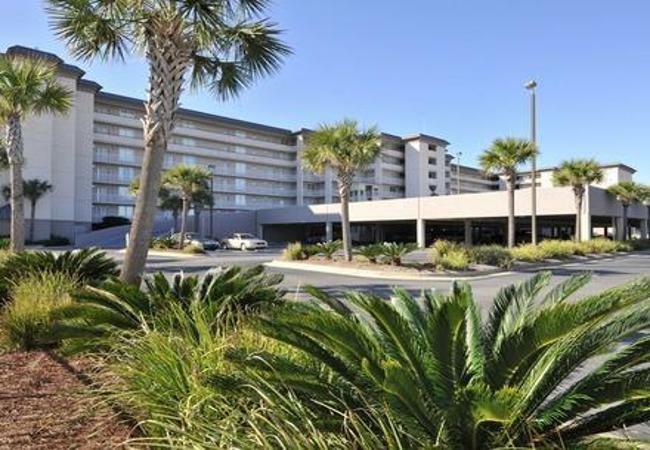 It is one of the newest resorts on the island and while being conveniently located near Fort Walton Beach and Destin, it never sacrifices its quiet and peaceful charm. When searching for Okaloosa Island condo rentals, why not consider the Island Princess? It is the perfect backdrop for everything the stunning Okaloosa Island has to offer. A stay here is a stay that you and your family will remember forever.